Lock replacement service is needed for every house and business. From time to time, our locksmiths arrive at houses and businesses that the locks on the doors are very old. They’re so old that some of them are even so rusty that they start to break apart. Look at the locks installed on your doors, what condition is it? It’s important to remember, a malfunctioning lock won’t secure your property, nor protect you from criminals! It’s also important to lubricate the locks once in a month to keep it working without interruption of dust and dirt. When you need a lock replacement service, you should call a professional local locksmith. Needless to say that we saw so many locks installed improperly by the owner to handyman of the property. You probably won’t call a locksmith to fix the transmission of your vehicle, so why to let handyman install locks for you? If you’re looking for a reliable locksmith service, you should call us. We are local mobile locksmiths, serving Allentown, Bethlehem, and Easton PA, as well as the greater Lehigh Valley PA.
Tell us the security requirement for your house or your office, and we will find the fastest and the cheapest solutions for your lock and key needs. For instance; if you have the only doorknob on your door, we highly recommend also to install a deadbolt, additional to your doorknob. That improves the strength of your door. Lock installation service done by professional locksmith can gain you peace in mind for a long time. Don’t hesitate to Call LockTech24/7 for any locksmith task that comes on your way. 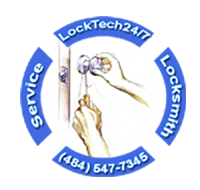 LockTech24/7 has a mobile lock replacement service and maintenance. That’s means, you don’t have to uninstall the lock, run to local locksmith shop, and do everything by yourself. You can rely on our lock replacement service because not just we do everything for you, but we also support our labor and products with a ninety days warranty. You can definitely have peace in mind when you call our locksmiths. LockTech24/7 is 24-hour locksmith services for emergency purposes. Nevertheless, you can call us to replace the locks on your door, at any time. Our locksmiths ready for any lock replacement service, whether for a house or a business. Our residential and commercial locksmiths are at the top level of locksmith services and they can handle any lock replacement service. We can also repair locks, change the key (re-key), and install high-security locks.